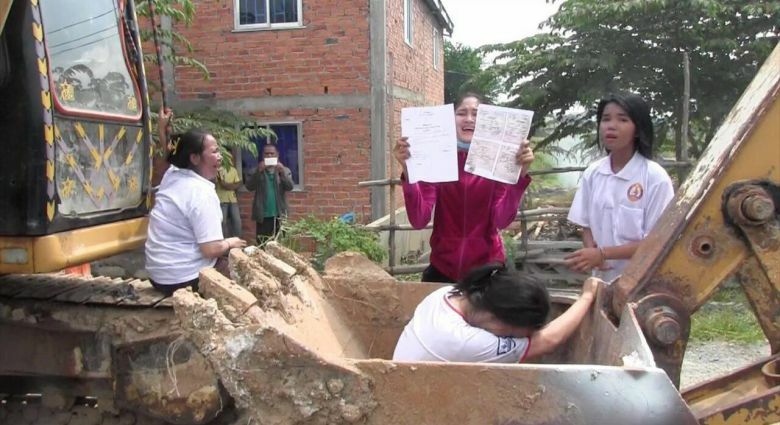 Three families in Kandal province’s Sa’ang district were offered compensation and new land after having been forcibly evicted last Friday following a Supreme Court ruling. Provincial Governor Mao Phearun said yesterday he had decided to compensate the families of Pon Thorn, Sae Kim Oun and Orn Yien, who lost a land dispute to a woman referred to in court documents as Her Excellency Mei Kalyan. In a meeting between the governor, police and officials from the land management and agriculture departments, the joint committee deemed the evictees “really poor families”. He said that the family of Thorn, a Kandal Provincial Military Police official who remains in detention after he was arrested during the protest against the eviction, will receive a 10-metre-by-12-metre plot and $3,000. Kim Oun and Yien will each get a 5-metre-by-12-metre plot and $1,500. The recipients yesterday expressed their satisfaction with the compensation. “We are really happy and we will stop protesting,” said Thorn’s wife Sean Seila, though she called for her husband’s release from jail. Despite Thorn’s continued detention, Phearun maintained authorities had not arrested him but had instead “invited him back” to a nearby military base and he could return “soon”. This entry was posted in Homeless, Housing Right, Human Rights, Kadal, Land, Land Concession, Land Dispute, Land Title, Phnom Penh Post and tagged Cambodia, Development, Land, Land Dispute, Land Title, Phnom Penh Post. Bookmark the permalink.